Imagine a standard inkjet printer that squirts ink onto a piece of paper, in the shape of the letter "A." Now imagine that instead of squirting ink, the printer is squirting a layer of molten plastic. Then it places another layer on top of that one, and another on top of that. Soon, you would have a thick, plastic "A." That's an extremely simplified explanation of how 3-D printers work. But the selection of materials is no longer limited to plastic ? ceramic, metal or even chocolate are available. One of the chief advantages of such printing is that an object can be fabricated layer by layer, says David Cawley, director of the model shop in the 3-D lab at Pasadena's Art Center College of Design, without the limitations of molds. "Three-D printing is very iterative ? it allows you to quickly make something, change it and quickly make it again," he says. For less complex objects, Grossman says injection molding is still the way to go. Though the start-up costs of producing a plastic injection-molded item can start in the thousands, once the molds are created each individual item may cost only pennies to produce. With the latest printing, however, there is no equivalent economy of scale ? an individual item that costs $5 to produce will continue to cost $5, no matter how many you print. Yet MIT professor Neri Oxman, a respected designer in the 3-D print medium whose works were exhibited as part of the Paris show , "Multiversit?s Cr?atives" last year, has compared the advent of 3-D printing to the advent of 2-D printing for its potential effect: "If you think about it, the movable type revolution allowed all of us to print books, and to democratize information. And 3-D printing is democratizing and revolutionizing the way we do fabrication." That democratization, however, will not spell the demise of craftsmanship or the importance of skill and training; great design still requires great expertise. 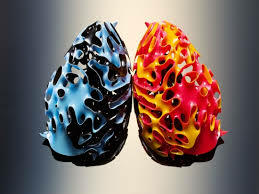 Kerry Hogarth, the London-based founder of "3D Printshow," an exhibition of 3-D printed art and technology in London, New York and Paris, says that the artists who create high-end 3-D art are comparable to highly skilled painters or sculptors ? they're just working in a different medium.